Will the US Mandate Module-Level Power Electronics in 2017? GTM Research is the market intelligence arm of Greentech Media. 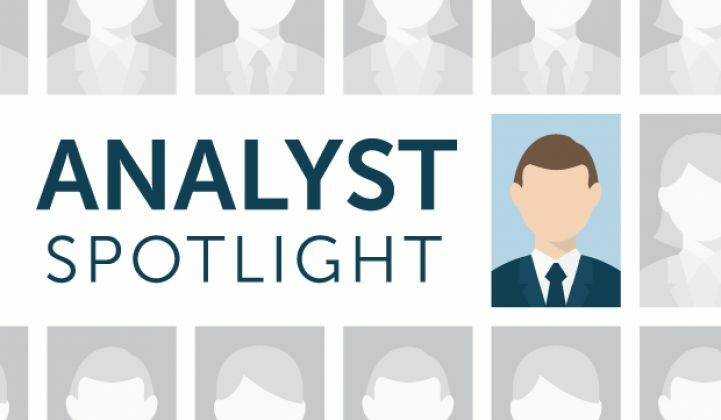 Analyst Spotlight is a regular column featuring commentary by GTM Research's solar, grid edge, and energy storage experts. The residential inverter market has changed dramatically over the last several years. Module-level power electronics (MLPE) have taken off, growing at rates far faster than the overall U.S. residential solar market. In the U.S. alone, MLPE shipments will exceed 1.5 gigawatts in 2015. Much of this growth can be attributed to the MLPE value propositions of increased performance and improved operational efficiency. However, the 2014 version of the National Electrical Code (NEC) has also been a major MLPE growth driver. The code, which has been adopted in the Northeast, mandates rapid shutdown requirements that are most easily met by MLPE. And we won’t undersell it -- states that abide by this 2014 code are dominated by MLPE vendors. If the 2014 version of the NEC resulted in shifting strategies and a shaken market, the response to the 2017 version is sure to be even more tumultuous. The proposed changes (apologies for the 6,600-page hyperlink) from the National Fire Protection Agency call for rapid shutdown to within a single foot of the array and also seek to limit in-array voltage to 80 volts. In short, the proposal essentially mandates that all rooftop PV systems have some form of module-level or in-array shutdown devices. As expected, these changes have been challenged and widely debated. SolarCity, Sunrun and SMA -- which all benefit from the use of lower-cost string inverters -- have questioned the reliability of rapid-shutdown solutions and the benefits to firefighter safety. 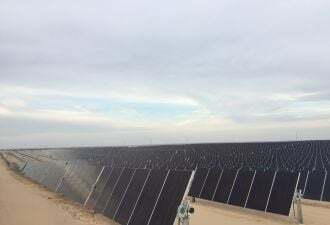 The Solar Energy Industries Association has also stepped in with concerns. Unsurprisingly, MLPE vendors Enphase Energy, Tigo Energy and SolarEdge Technologies, as well as the firefighter associations, have responded in support of the rule. At this point, the period for public input has passed, and it is widely expected that the revisions will be confirmed. For now, the industry is planning for the change. NEC 2017 will roll out on January 1, 2017, with states and municipalities gradually adopting it on their own timelines. The 2014 code was rolled out first in New England, and numerous states are several years behind in adopting the latest versions of the code. 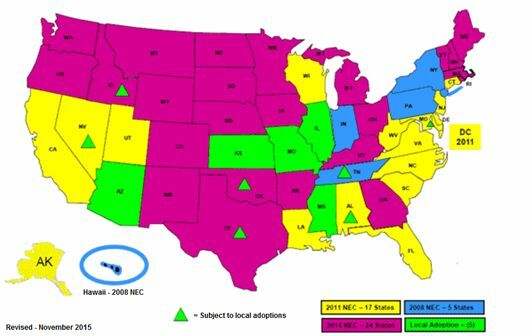 Many states, including California, likely would not adopt NEC 2017 until 2020 or later. At the moment, there is no one-size-fits-all solution, and what might work in the residential market might not work in the commercial sector. The commercial market would be most affected by the code changes. Until now, commercial EPCs have predominately complied with NEC 2014 by placing string inverters directly on the roof adjacent to the array rather than using microinverters or DC optimizers. The 80-volt in-array limit in the 2017 version of the code would render this practice insufficient. Overall, the commercial market is still fairly resistant to MLPE due to price sensitivities, and many point to in-array shutdown devices (which do not currently exist commercially) as the cheapest way to meet the code. The picture in the residential market may seem clearer due to such high adoption levels of microinverters and DC optimizers, but the reality is not that simple. We expect ongoing adoption of NEC 2014 and the subsequent rollout of NEC 2017 to continue enabling MLPE to gain share. However, there is still plenty of opportunity for string inverters to take back some of the market. Many fleet-level installers with strict capital requirements are going to continue optimizing on first costs. Exceptionally low-cost string inverters with proprietary or financeable third-party rapid shutdown solutions could be compelling options for compliance. With a growing residential market, we expect string inverter shipments to grow year over year after the federal Investment Tax Credit drops next year and NEC 2017 is implemented, even with a rising share of MLPE. This is not to say that string inverter vendors will not react to the growing MLPE market share. The rise of SolarEdge in particular has strongly piqued the interest of competing inverter vendors, and the market is ripe for competing DC optimization technologies. With this in mind, Tigo Energy would be an apt acquisition target for inverter vendors hoping to broaden their portfolio with code-compliant solutions -- that is, if a module partner looking to gain a larger piece of the residential pie doesn’t get to them first. We also see NEC 2017 as a strong opportunity for integrated smart and AC modules that offer full code compliance, as well as potential labor and material savings from replacement of the module junction box with MLPE. Increasing adoption of module-level power electronics and falling costs will strongly contribute to their growth. 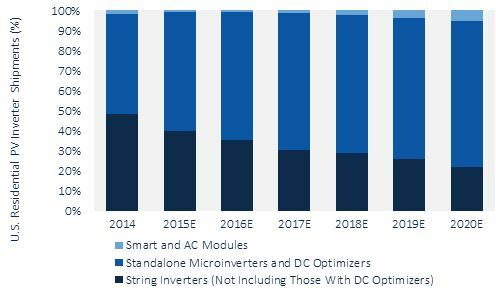 The vendor landscape is rapidly evolving -- recent integrated module commitments include Enphase and SunPower -- and we expect smart and AC modules to grow from just 0.9 percent of the U.S. residential market in 2015 to 5.3 percent in 2020 as a result. Scott Moskowitz is a GTM Research solar analyst covering PV systems and technologies. For more information on GTM's inverter research, contact Zack Munsell at zmunsell@gtmresearch.com.